A group of filmmakers have shared images of the gut-wrenching moment they stumbled across a starving polar bear clinging to life in the wild as it scavenged for food. Photographer Paul Nicklen and filmmakers from Sea Legacy spotted the bear on the Canadian Baffin Islands this summer. The group captured disturbing images of the emaciated bear, with its white hair hanging off its bony frame, dragging its back legs behind it. Mr Nicklen was used to seeing bears in the wild, having grown up in Canada’s far north, but nothing could have prepared him for this encounter. “We stood there crying—filming with tears rolling down our cheeks,” he told National Geographic. Mr Nicklen said he wanted to intervene but was powerless without a tranquillizer gun or high-fat animal meat. Instead, he decided to film the bear’s slow death to be sure it did not die in vain. The half-ton bears rely on sea ice to find their main source of food – seals, causing them to suffer the effects of climate change acutely. With their Arctic home warming at an alarming rate, the sea ice which they use to hunt for seals is melting and grizzly bears are moving into their territory. A study published last year by the European Geosciences Union found melting sea ice continues to be an existential threat to polar bears. Another study published this year discovered the bears rely heavily on their sense of smell to find their prey. To do this, they walk across the direction of wind to test the air from as wide a range as possible. But wind speeds are projected to increase as a result of climate change, which will make it harder to pick up and follow the scent. No doubt many gullible people will fall for this unashamed nonsense. 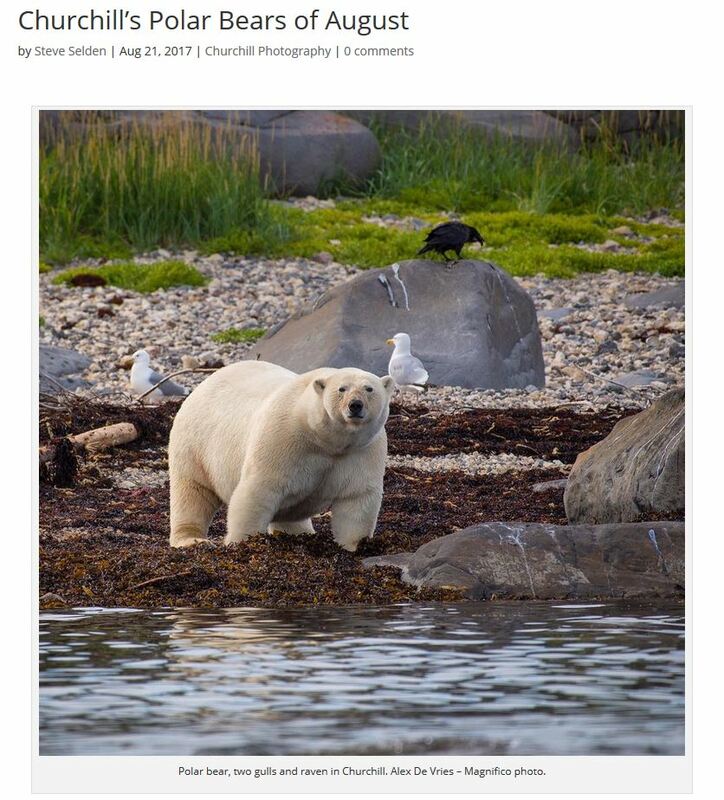 It will not have occurred to them that polar bears, just like all animals, get old, sick or wounded, and, unable to hunt, end up starving to death. It might be sad, but it’s called nature. What on earth do these people believe happens to polar bears when they get old? Get sent to Old Polar Bears Homes? ‘Yes, I have seen bears in good shape – but I have also seen dead and starving polar bears. Bears walking on the shores, looking for food, bears trying to hunt reindeer, eating bird’s eggs, moss and seaweed. ‘Many times I have seen horribly thin bears, and those were exclusively females – like this one here. ‘You have to be a little bit careful about drawing conclusions immediately. The bear may be starving but it may just be old. Researchers with the Canada-Greenland Joint Commission on Polar Bear assessed the Baffin Bay and Kane Basin polar bear populations bordering sections of Nunavut and Greenland and found that both groups had numbers higher than was assumed, based on the last count conducted in 1997. Using aerial surveys, biopsies of tissue samples obtained by darting and the capture and satellite tagging of 125 bears, the research team found that the Baffin Bay bears, which were last counted at 2,074 twenty years ago, have kept relatively stable in numbers and actually increased slightly to 2,826. Indeed, the Canadian authorities are so unconcerned about the Baffin Island bears, that the locals are allowed to kill 132 per year for sport and food. “It’s a dying polar bear, all polar bears die, just like people. Only they don’t get to go to old bear homes. Read some truth on this by Susan @sjc_pbs Crockford. don't get to go to old bear homes. “… polar bears do starve in the wild on a regular basis. As apex predators, they have no natural enemies to put them out of their misery when they become too old or injured to hunt”, Amstrup explained. In fact that “slight increase” was a very healthy 36%. That’s the mantra of “climate change”? All bad things are projected, forecasted, predicted,modeled… the future is bleak, “dangerous” catastrophes loom. Floods, hurricanes, typhoons…are projected to increase as a result of climate change. Hot spells, droughts, wildfires, starvation are projected to increase as a result of climate change. It all sounds the same. Scare-mongering propaganda works! First, the crying photographer makes me want to dress him in his jammies, get him some hot cocoa and send him back to Mommie’s basement. Second, the first year I moved to Wyoming, there was an extremely harsh winter. Sub-zero temperatures and 6 ft drifing of snow. I would see dead and dying antelope along the fence lines because they were too weak to cross. As the winters became less harsh, these scenes decreased. Same for mule deer. I have one mule deer in my yard right now that has some kind illness and it cannot walk well. Yesterday, it tried to jump the fence and caught a leg. My husband cut the wire to free it. I have had nearly a dozen just die due to cold or injury over the last 30 years. I was a photographer for many years. I have pictures of antelope and deer that were ill or old and dying—as bony as the polar bear. This photographer is very, very poor at his job or he’s lying. Indeed this photographer could have got a lot, lot closer! This Amstrup is seriously deficient. Polar bears do have natural enemies: other polar bears and humans (since humans colonized polar bear habitat thousands of years ago). This bear, feeding from a garbage can near a camp, was probably protected from other polar bears by human presence. And, from the article, this description of polar bears as “half-ton bears” is as accurate as referring to people as “500 pound primates.” Yes, some males are that big but they are the exception. NO female polar bear ever weighs that much. Unfortunately people readily fall for this kind of emotional appeal which is why the Green Blob constantly uses it. The only thing that surprises me is that they didn’t digitally modify this video to have flies on its face (a popular image for raising cash for starving people). Go to any country that doesn’t have a welfare state of some sort & you’ll see old people on the streets looking like that, or refuge camps around the world or prisoner of war camps or visit your local cancer ward (a 67 yr old friend recently went in 4 mths, from 16 stone & died at 7 stone, not nice ). presumably that’s all the fault of ‘climate change’™as well. These green zealots have no morals just lie & distort everything. After he filmed its death , he must have continued the science by collecting blood/flesh for a biopsy …and then what did that reveal ? Or did he not bother ? Also preserved at polarbearscience is this fat bear. Healthy? Obese? Pick your own adjective. At any rate, this bear will be able to swim a long way! tears of laughter doubtless, with another prize propaganda pic ‘canned’ and wallowing in the gormless sanctimony of seeing nature doing what it does, it will come to all of us, that’s what nature is, the survival of the fittest. ‘National Geographic’ always exaggerated, representative of bog standard tourist pap glossy…………… and good grief, how piteous are these dorks? Yes, we read it at school for the pictures of bare breasted dusk maidens. In my science career working on geologic, hydrologic, and atmospheric events in the field from the Arctic Circle to the Antarctic Circle throughout the Western Hemisphere from Sea Level to 14,000 ft, my colleagues and I have encountered large mammals for over 60 years in their journey to death due mostly due to advanced age as well as to injury from other, mostly natural cauzes. For example, an aging, 16 pt. Elk leaves the herd to die under a tree alone, sometimes with snow piled high on it’s antlers for days or weeks before death brings the final sleep. These are solemn moments for us all as we are destined for the last rest. However, to mark the passing of any great creature to global climate change solely is a grievous error, if not a scientific omission, without aporopriate study. When this emaciated Polar Bear dies, or one of his/ her emaciayed realtives, what do these Eco..Loonies want?? A State Funeral?? Never let a good catastrophe go to waste when you can affect someone’s beliefs or opiniion. News flash…nature is not like a Disney movie. Well said. Disney did great damage to generations of children by portraying a very, very false world. I wonder of what did it died? Polar Bears are often carriers of parasites — hookworms, Trichinella spiralis, Haemonchus contortus, Dochmius ursi and Baylisascaris transfuga to name just a few. If these Polar Bears eat other predators (e.g. humans, other bears, Arctic foxes, etc) then their parasitic load can increase hugely. Apparently Polar bears rarely die of these parasites, however there is some evidence that older animals that are very infected and starving tend to succumb to their inevitable death faster. For more information just put ‘polar bear parasites’ into your favorite search app. So, when preparing Polar Bear meat for the BBQ, please always ensure that it is thoroughly cooked through, and never eat Polar Bear livers as the vitamin A level is so high it is toxic. Does that lead to the ones mentioned in and using this story and images? That was the intent of my search initially, however as far as I can find there’s no information. I also can not find evidence of a postmortem on that starving animal. Yep, they write stories like this one.. They live as a group-think running models. AndyG55 – Indeed. Those are the kind I meant. If they were really concerned why didn’t they feed one of the group to the bear? V.good, the volunteer would be a shoo in for the Darwin award. These are the only bears they are able to get close enough to, to film… and survive. One sickly polar bear is not a trend. That may be hard to grasp for some gullible folk but there it is. As I said elsewhere. The article and video are nothing more than pap for the cretins. Especially those that emote without considering reality or any form of critical thinking. Do Polar Bears live in the mountains these days? Inchnadamph’s not too mountainous but contains a lot of Cambrian era’d limestone, testimony to former tropical regimes. Our big pond as seen nowadays got going across half that time, just about when a colosall river system flowed SW from Barents into a burgeoning North Atlantic Ocean. Geicke got it as Wegener then Dansgaard. In the same way that tornadoes never touched down before people had mobile phones on which to film them, polar bears never used to die of old age before National Geographic were there to film the last rites. In the early 1990’s when visiting my niece and her husband in Santa Barbara, Lynn and I drove up the coast to the Monterrey Peninsula and hiked in the Point Lobos State Reserve. The trails wandered in and out along the coastline. You could look out to Bird and Seal Rocks and watch the sea otters in the kelp beds. The otters were wound up in the kelp hitting clams on their chests with rocks. I looked her in disbelief, wishing to tell her that everything died of natural causes. Further, were that not so, we would be up to our necks in sea otters and a lot of other creatures. But I stayed silent and just shook my head in dismay. Yes, these folks exist. Thanks to modern society they are not weeded out of the gene pool by natural causes. Increased slightly? From approx 2000 to approx 2800 is a 40% increase! I noticed that too, but I am willing to say closer to 35% increase, but either way, that is a huge increase in population. Yup, I agree. Just did quick estimate based on 2000 and 2800. The point we probably agree on is that for the quoted article to say “slightly” underscores how the media manipulate public thought with their choice of words. As a professional statistician it annoys me no end when a mainstream article describes, say, 60.4% as “over 60%” when they want a number to appear large and “barely 60%” when they want the same number to appear small. And they do it all the time. A decrease of that size would have been hyped as “plummeted”, “dramatically fallen” or some such. I’ve asked several of the AGW trollups that inhabit the forums, but none of them seem to be able to answer a simple question. “How did polar bears survive during the first 7000 – 8000 year of the Holocene, when Arctic sea ice was often “summer ice free”, and was certainly significantly LOWER than it is now”?